LED color temperature is a hot topic this design season. And with good reason. Color temperature in retail lighting triggers emotional responses that can affect customer purchases in the short term, as well as foster meaningful relationships with your store. Color temperature is the tone that a light radiates within a cool (blue) to warm (red) spectrum. In nature, as the day progresses, the sun’s light changes color temperature from warm to cool and back to warm. We are hardwired to react to these changes we experience throughout each day. Light guides our internal clock, telling us when to wake up, when to wind down, when to sleep, and everything in-between. So it carries with it great power in affecting our behaviours as consumers. Blue tones wake us up and keep our energy levels high so we can get things done during the day. Warm tones of late afternoon and evening trigger melatonin, leaving us feeling relaxed and sleepy. LED Color temperature can be used to help customers see more accurately, to encourage lingering at your displays, and even to create a sense of confidence. With the range of DLC products offered in custom color temperatures, your design possibilities are endless. 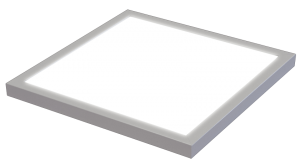 In addition, DLC offers LumiSheet LED panels and LumiStick LED bars in variable white. The color temperatures of these variable white products can be tuned as needed, or programmed to change on a schedule. By making your display resemble mid-day blue tone sunlight, you’re triggering customers’ ability to feel confident and capable in making purchasing decisions. They’ll also be more likely to linger at your display. By opting for the warmer LED color temperatures the sun produces towards the end of the day, you’ll create a vibe that’s more about unwinding. This tone might be right for displays that focus on rest and relaxation. For display backlighting, opt for LumiSheet at 5300K for a mid-day effect, or 3500K for a relaxing feel. If you’re looking for a complete, diffused backlight, check out our new LumiFixt, which combines LumiSheet with a diffuser layer and sleek housing all in one. It will beautifully diffuse light of any color temperature. Our eyes are designed to see best under daytime light. Eyes can feel strained in too-warm lighting, making it harder to see product details. Therefore, keep lighting cool to highlight the crispness of patterns and the sparkle of jewelry. Cool tones will also help showcase how an item moves and flows. Add high CRI to ensure the product will be seen properly by the human eye. 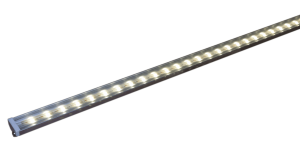 For product showcases, consider direct light with LumiStick at 5300K. Ask for it in high CRI and opt for a 27-degree angle to highlight your merchandise. Mirrors and fitting rooms should let customers look their best. Ensure mirror lighting is high CRI, and consider cool temperatures to showcase how items look as the customer moves. High Kelvin temperatures are ideal for seeing details because we evolved to get more work done in the cool afternoon light. That said, your customers often know best which kind of light is right for their fitting room experience. 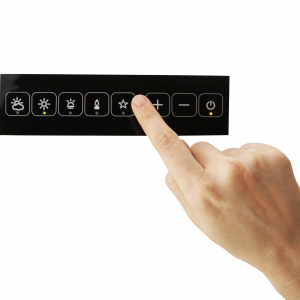 Try controls inside each room to allow customers to change the lighting to suit their own needs. That way, they can adjust the lighting to fit the occasion they’re dressing for. If it’s a beach getaway, they can set their lighting to full sun. If it’s an evening event, they can set it for candlelight. 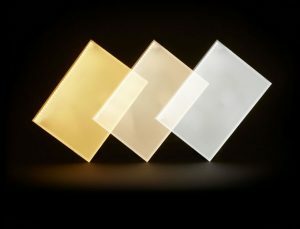 For mirror lighting, choose high CRI LumiSheet facing the customer. Opt for cool tones, such as 5300K. Consider incorporating DLC’s Omni Control into change rooms and pair it with variable white CCT LumiSheet to create a custom, color tuneable space for consumers. These are just some beginning ideas on how to make LED color temperature work for your retail designs. The possibilities are endless, so please reach out to your DLC LumiSheet rep here and we’ll help you with your specific project’s needs.